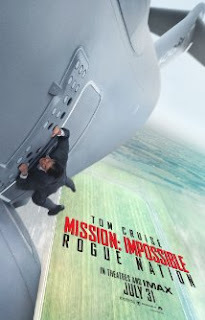 Flick Hit: Mission Impossible Rogue Nation review: I'll have another! Mission Impossible Rogue Nation review: I'll have another! Mission Impossible without Tom Cruise would be no Mission worth accepting and Tom Cruise takes stage not only as an agent who can do the Impossible but as an actor willing to do his own stunts. As seen on clips he is on a plane taking off in air — some might think it's a green screen, but in fact the scene is real and it's actually Cruise. Tom has my respect for soaring in the skies just to shoot a scene. But Mission Impossible is more than Ethan Hunt (Tom Cruise) doing the unimaginable for his country and even the world. Rogue Nation begins with IMF disbanded and Hunt on the run from the CIA. His only way to keep from getting caught is by losing all traces of himself and not involving those close to him. There's just one catch: in order to take down another organization similar to the IMF, he needs the help of his team, past faces we all know like William Brandt (Jeremy Renner), Benji Dunn (Simon Pegg), and Luther Stickell (Ving Rhames). Together they go Mission Impossible to take down a Rogue Nation. Mission Impossible: Rouge Nation is full of action like previous installments and has that James Bond vibe in addition to humor from Benji bringing out a few laughs. After watching Rogue Nation, I can say the franchise is still strong and I believe there's no reason for Mission Impossible 6 not to happen. Will Ethan Hunt and company take down the Syndicate? Will the IMF be reinstated at the end of this movie? You'll have to go see it yourself. If you're new to the franchise and want a movie similar to the James Bond films, I recommend Mission Impossible. Summer movies are almost over and Rogue Nation is not one to miss.